This instrument has never been owned, but been used as a show model in our retail location. There may be some very minor cosmetic blemishes. Inheriting the many merits of top-of-the-line Yamaha handmade flutes, this model offers rich, nuanced tonality over a wide dynamic range. The 600 series combines the brillance of nickel silver with the characteristic mellow timbres of sterling silver. 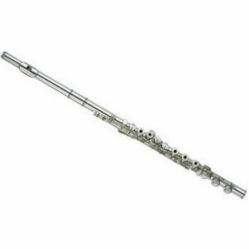 The YFL 677 comes with a hand-finished headjoint based on the Type A headjoints supplied with the 800 and 900 series handmade flutes. The keys feature traditional pointed key arms, reflecting the highest level of craftsmanship and adding visual elegance to this outstanding instrument.